Chester County urban centers represent concentrations of population, employment, commerce, institutions, and services for the County. The Chester County Planning Commission strives to provide planning services to the 15 boroughs and City of Coatesville. Below are several planning resources that the Planning Commission provides for the urban centers. 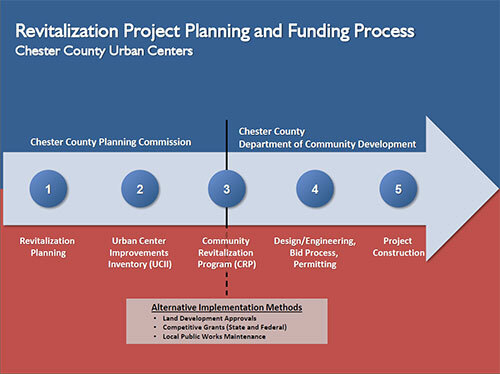 The Chester County Planning Commission (CCPC) expanded its urban center revitalization work program in 2015 to offer limited/small-scale in-kind urban planning services to the 16 urban centers (15 Boroughs and City of Coatesville) in Chester County. This assistance involves advancing planning projects identified in adopted municipal documents, endorsed studies, and/or the Urban Center Improvement Inventory (UCII). Eligible projects under this service include, but are not limited to the following: revitalization plan updates, official maps, specialized analysis (parking, trails, corridor studies), and mapping. Given limited staff resources, all project requests are selected by CCPC staff on a case-by-case basis. A selected urban center must enter in a contractual agreement with the County to have a clear understanding of the project scope and to establish uniform expectations. The cost for assistance varies per project due to size/scope/complexity. The Chester County Planning Commission along with the Chester County Department of Community Development (DCD) assist in the planning, inventorying, and funding of revitalization improvement projects within each urban centers. The process begins with the urban center's Revitalization Plan. To be eligible for county funding all urban centers must have an adopted revitalization plan. The plan should identify specific goals and projects that promote revitalization and assist with future growth and development over a 5-10 year period. Another key component to the process is to update and submit priority planning and capital improvement projects to the Chester County Urban Center Improvements Inventory (UCII), which is updated annually. Once projects are identified within the UCII, they are eligible for county funding, in particular the Community Revitalization Program (CRP) grants through DCD. Urban Centers can apply for this funding, which provides construction funds for public infrastructure improvements, on an annual basis. Once funding for the project is awarded, design and engineering on the project can commence. Finally, after engineering of the project concludes, the project can advance to the bid and permitting process and construction. The Urban Center Improvements Inventory (UCII) is a comprehensive record of documented revitalization needs within Chester County's urban centers (15 Boroughs and the City of Coatesville). The Inventory includes proposed capital improvements and planning projects that are directly linked to goals, objectives and policies within the urban center's adopted planning documents (comprehensive plan/revitalization plan). The goal of the Inventory is to connect the urban centers' revitalization plan priorities with implementation funding. The UCII update is complete and will can be found here. In an on-going effort to support the 16 urban centers in promoting revitalization and assist with future growth and development initiatives, the Chester County Department of Community Development, Chester County Planning Commission, and the Chester County Economic Development Council host urban centers forums. The forums are centered on specific topic areas that pose both challenges and opportunities for the urban centers. They are designed to promote data sharing and comparing experiences with one another through friendly communication. 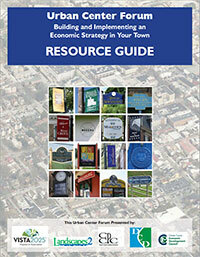 The Urban Center Resource Guide offers demographic and economic data of the 16 urban centers, as well as, information about County programs and funding opportunities at the state, regional, county and local levels. The Questions and Considerations for Municipal Leaders Worksheet offers step-by-step guidance when considering redeveloping a underutilized property, such as, identifying site ownership, reuse options, market realities and redevelopment impact.